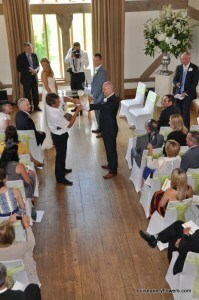 Weddings now take place all throughout the year and not just in the summer months. By November though for an events florist like me, things are definitely becoming a little steadier. 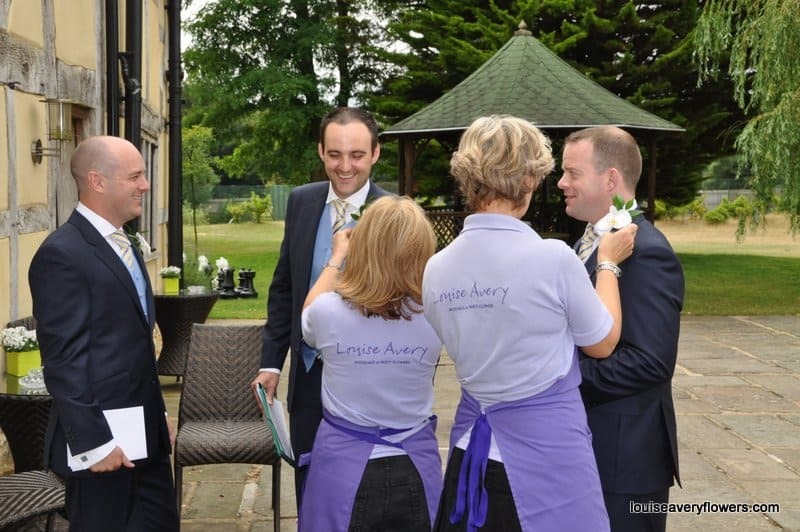 It’s a great time though to indulge in a quick glance over the shoulder at a recent Cain Manor wedding. I met such a lovely couple last year who asked me to provide their wedding flowers and decorations. They both lived and worked in Zurich, Switzerland so everything was planned and managed at distance. This was something that I had done many times before but of course was all new to the bride and groom. When everything was finalised and all preparations were complete I asked the bride if she would consider being one of my very first real life wedding features. I had explained that I was very keen to get a blog up and running and would be thrilled if she would like to be featured. She not only very kindly agreed but invited me to the wedding as well! It was a really beautiful day on so many levels and so it is my very great pleasure to introduce one of my first real-life weddings, featuring the very lovely Amanda and Matt……….. The lovely Amanda and Matt worked hard to plan their perfect English country wedding whilst both living and working in Zurich, Switzerland. Despite the distance the planning and preparations went really well and their August wedding was even blessed with sunshine. 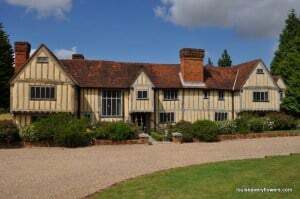 Choosing Cain Manor as a wedding venue must have been an obvious choice as Amanda is a Hampshire girl who grew up just outside Winchester and Matt is a Hampshire boy too! 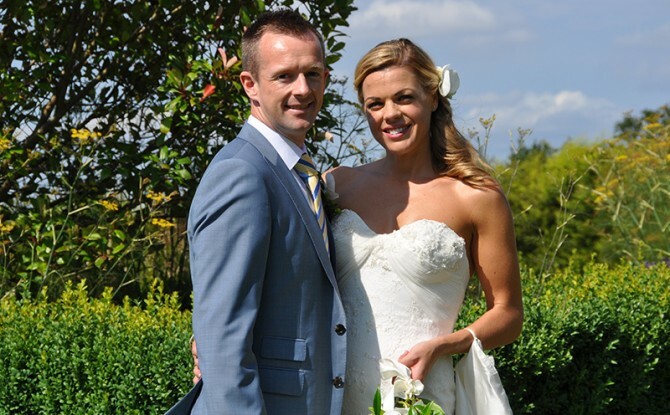 Amanda wore a Sassi Holford dress and chose to carry a contemporary and elegant trailing bouquet to compliment her elegant and feminine look. As Amanda loves orchids, white Phalanopsis Orchids seemed the perfect option and were teamed with fresh green foliages to give a hint of the decorations to come later on in the day. 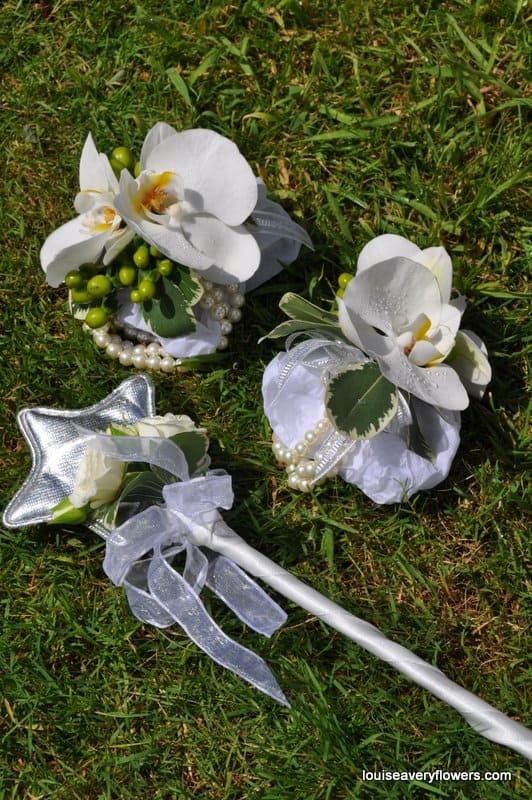 For added glamour Amanda ordered matching wrist corsages for the witnesses to wear and just for fun, a decorated fairy wand for the little flower girl. 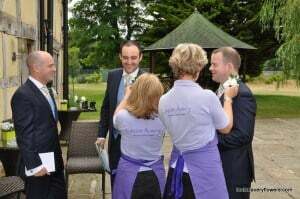 The boys weren’t left out either as the principle men of the bridal party all had co-ordinating white orchid buttonholes. It was a beautiful ceremony and as an additional surprise for all the guests Matt & Amanda arranged for ‘Molly’ the barn owl to visit. 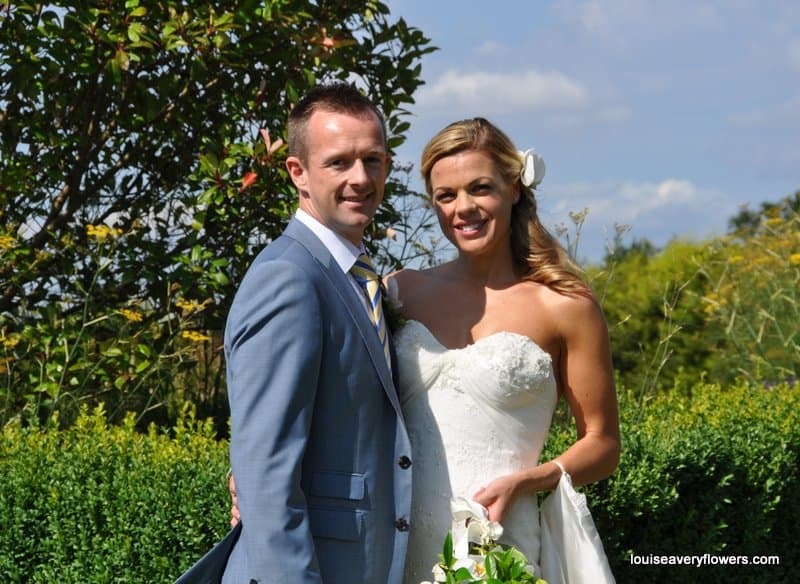 Molly had the wedding rings tied by satin ribbon to her leg and flew in to deliver the rings to the best man. 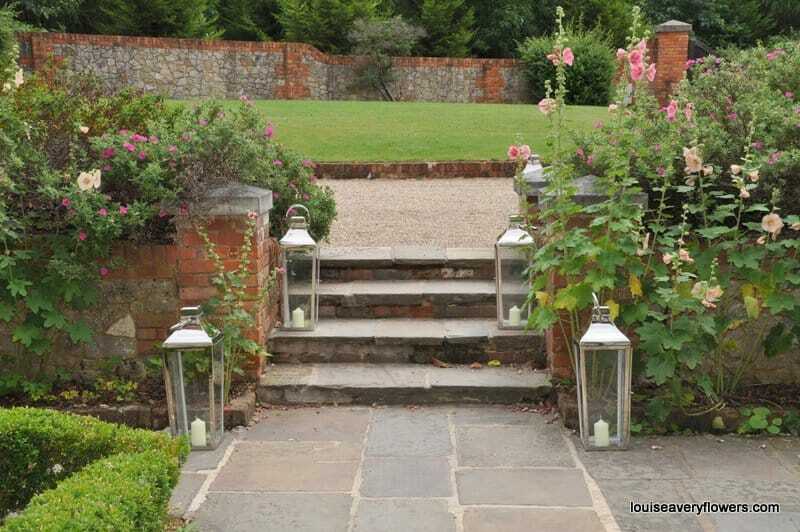 The wedding venue decorations started with fabulous large floor-standing glass and chrome coach lanterns. 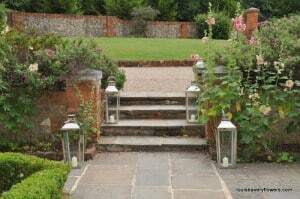 These would also welcome the evening guests as they travelled up the drive and approached the front door. The reception room was where the guests first gathered. 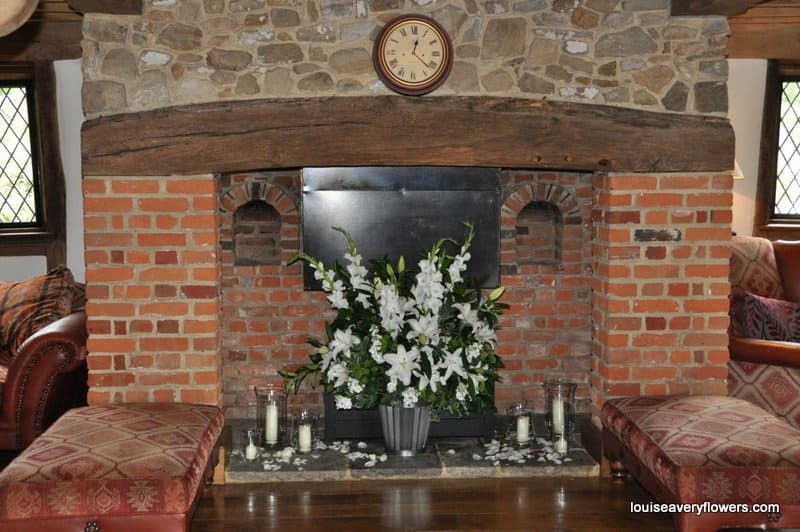 This room was decorated with vases of Amanda’s favourite white flowers. 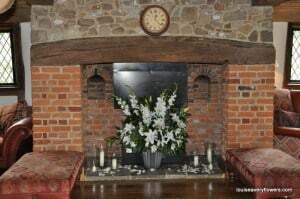 The vases had accents of fresh lime green together with the flowers and chunky church candles and scattered fresh rose petals filled the fireplace. The ceremony room was breath taking. 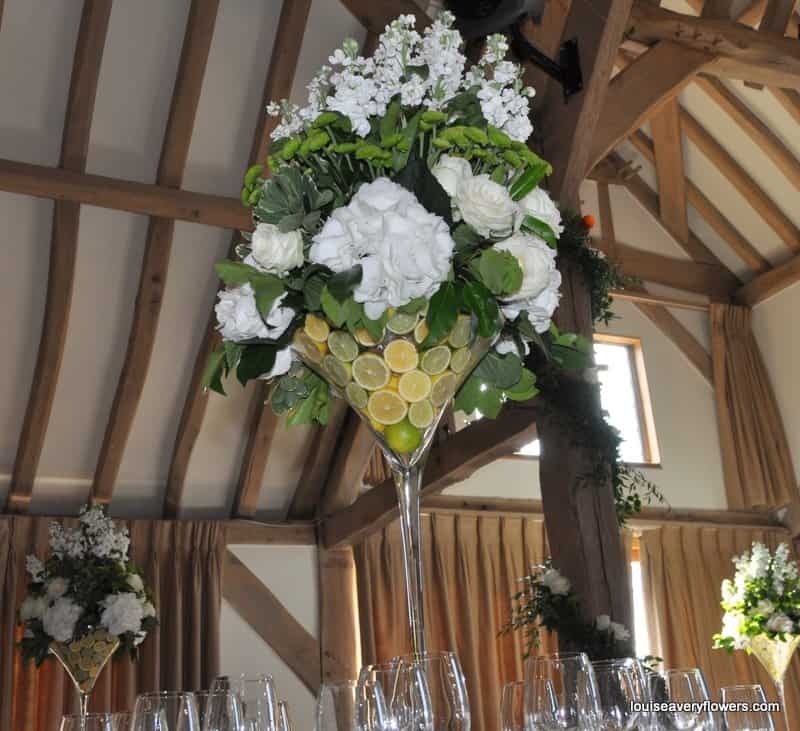 Two stunning plinth displays filled with the bride’s signature combination of fresh white flowers and zingy lime green greeted all the guests as they entered to take their seats. Foliage garlands incorporating white roses added style for the day. Fairy lights entwined throughout the garlands, also gently swathed around the wooden pillars adding an extra twinkle to the evening party. 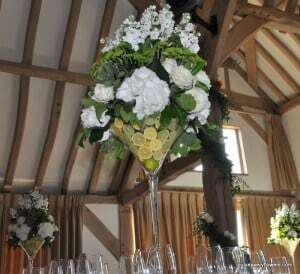 For the wedding breakfast, Amanda was very keen to maximize the height of the oak vaulted room, so she chose tall glass martini vases topped with a summer floral collection including scented white stocks and roses. With the table decorations above head height and sight lines kept clear, Amanda decided to bring her fresh lime green accents into place with the use of actual lemons and limes. These filled the base of each martini vase and created a zesty cushion for the flowers. As a finishing touch, white flowering miniature rose plants in lime green covers were placed on the terrace occasional tables. The guests were able to enjoy these during the garden drinks reception whilst they enjoyed the sunshine and admired the fantastic rolling country views. Winter Wedding Colours~Rich reds or winter white?